پوریزدیان محمدآباد, ابراهیم, سرائیان, احمدرضا, دهقانی فیروزآبادی, محمدرضا. (1393). مقایسه ویژگی‌های خمیر کاغذ کرافت حاصل از تنه و شاخه ممرز. مجله صنایع چوب و کاغذ ایران, 5(1), 139-152. ابراهیم پوریزدیان محمدآباد; احمدرضا سرائیان; محمدرضا دهقانی فیروزآبادی. "مقایسه ویژگی‌های خمیر کاغذ کرافت حاصل از تنه و شاخه ممرز". مجله صنایع چوب و کاغذ ایران, 5, 1, 1393, 139-152. پوریزدیان محمدآباد, ابراهیم, سرائیان, احمدرضا, دهقانی فیروزآبادی, محمدرضا. (1393). 'مقایسه ویژگی‌های خمیر کاغذ کرافت حاصل از تنه و شاخه ممرز', مجله صنایع چوب و کاغذ ایران, 5(1), pp. 139-152. پوریزدیان محمدآباد, ابراهیم, سرائیان, احمدرضا, دهقانی فیروزآبادی, محمدرضا. مقایسه ویژگی‌های خمیر کاغذ کرافت حاصل از تنه و شاخه ممرز. مجله صنایع چوب و کاغذ ایران, 1393; 5(1): 139-152. Bowyer, J. L., Shmulsky, R. and Haygreen, J. 2002. Forest product and wood science as an introduction. 558p. Castillo, SV. A., 2002. Potentials of branch wood pulp from selected plantation: Moluccan sau (Paraseria(L),Nielsen). San Miguel Corporation Professorial chair Lecture. Philippines.21p. Castillo, SV. A., 2003. Characterization of the branch wood pulp from bagras (Eucalyptus deglupta Bl.). San Miguel Corporation Professorial chair Lecture. Philippines.11p. Chase, J,A., Hyland, F. and Young, H,E., 1973. The Commercial Use of Pucker brush pulp. Tech. Bul. 65. main agri experiment station. University of Main at Orono. 56p. Einspahr, W.D. 1976. The influence of short- rotation forestry on pulp and paper quality. II. Short rotation hardwood. Tappi. 59(11): 63-66. Fellegi, J., Janci, J., and Chovance, D., 1974. Pulping and papermaking proper ties of softwood and hardwood branches. In: symp.int.Eucepa,Madrid, P203-213. Horn, R. A. 1978. Morphology of pulp fiber from hardwoods and influence on paper strength. United States department of agriculture. Forest Product Laboratory. Research paper Fpl 312. Hunt, K. and Keays, J. L., 1973. Kraft pulping of trembling aspen tops and branches, Canadian journal of forest Research 3(4): 535-542. Koopmans, A. and Koppejan, J., 1997. Agricultural and forest residues generation, utilization and availability. Regional consultation on modern applications of biomass energy. Malaysia. 23p. Mahdavi, S. and Habibi, M.R., 2004. 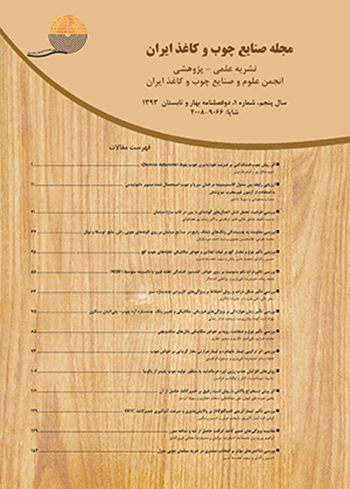 Comparative investigation on fiber dimension of trunk and branch wood of Carpinus betulus L. Iranian Journal of Wood And Paper Science Research 19(2): 243-258. Michaud, C.F. and Smith, D.C., 1964. Chemical and physical properties of sulfate from various portions of deciduous tree. M.S. dissertation. 150p. Murakami, K. and Yoshino, D., 1985. A Fundamental study on whole- tree pulping of Acacia mollissima wild. Bulletin of Kyoto University Forests 56: 261-266. Samariha, A. and Kiaei, M., 2011. Chemical composition properties of stem and branch in wood. Middle East Journal of scientific Research 85(8):967-970. Samariha, A., Kiaei, M., Taleipour, M. and Nemati, M., 2011. Anatomical differences between branch and trunk in Ailanthus altissima wood 4(12):1676-1678. Stockke, D. D. and Manwiller, F.G., 1994. Properties of wood element in stem, branch, and root wood of Black oak (Quercus velutina), IAWA Journal 15:3.301-310. Zobel, B.G. and Buijtenen, P., 1989. Wood variation, its causes and control, springer- Verlag, Germany. 348p. Wathen, R., 2006. Studies on fiber strength and its effect on paper properties. PhD thesis, Department of forest products Technology, Helsinki University, 98p.